An FO! An FO! It feels like I never finish anything these days, just start new things and leave the old to the wayside. Does it count as an FO if it's only yarn? I don't know. I don't care. It's a spinning FO to me. It's a finished object, and that object is a skein of yarn. 2 skeins for one project. The white is locks from my British Romney fleece. The grey is Romney, too - American Romney leftover from the American breeds workshop I went to. It's just a tiny bit, 5g or so, but I thought it would be nice to use the two Romneys in a project together. I am totally jealous of all these American colored Romneys, by the way - practically every American Romney fleece I see on Ravelry is some beautiful shade of gray or brown! I only ever see white around here. The gray locks were markedly different from the white - I don't know how much of it is the US/UK difference, and how much is just variation between fleeces. The gray wasn't quite as long, and with not as tight a crimp. 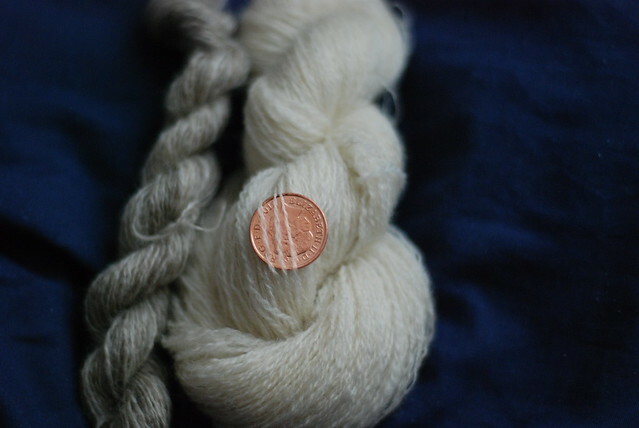 The gray Romney was thoroughly scoured, while there was still some lanolin left in the locks that I processed myself - so the spinning process was also different. I plan to use these two cousins together in a shawl - Emanuela is my current top choice - striping the gray & white for the body portion, and the lace border being all in white. That definitely counts as an FO! Nice work!